Experience the excitement of the animal kingdom with our playful wild safari Christmas tree ornaments. Encounter the most exciting wild safari animals without leaving the comfort of your home; our wild safari animal friends set includes a lion, giraffe, hippo, elephant and zebra. These highly detailed safari animals will bring much delight to young and old. Adorable eyes peer from the cute faces of these adorable wild safari animal friends. 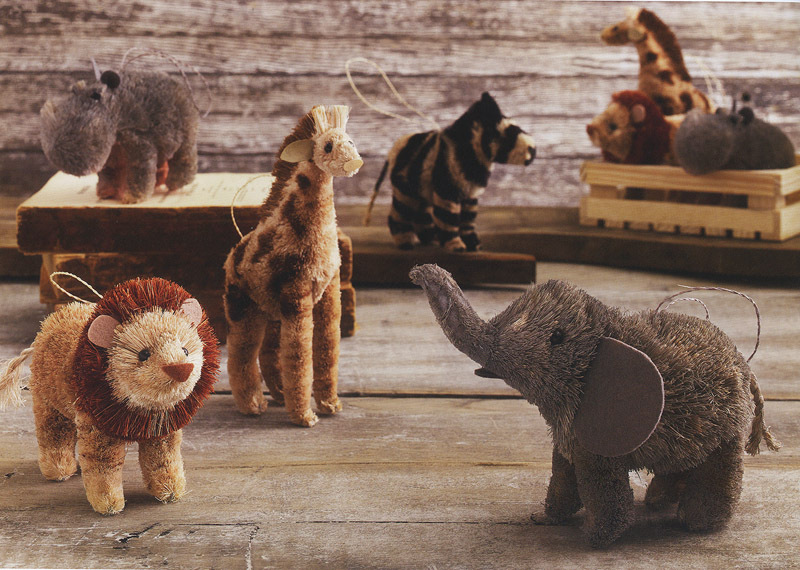 Our adorable wild safari animal friends are hand-crafted from natural sisal. These beautiful and highly decorative Christmas tree ornaments are meticulously crafted from sisal by master artisans. Each wild safari ornament is fitted a jute twine monofilament loop, making it easy to hang these wonderful ornaments on your Christmas tree. Decorating your Christmas tree is one of the most beautiful holiday traditions. It is a unique opportunity to bring the family together and create memories that will last a life time. Our safari friends, with their adorable looks, will look right at home in any interior. A nice set of heirloom quality ornaments sure to be enjoyed for many years to come. Our safari friends are packaged in a wooden crate which makes them a great holiday gift idea, for yourself, or like-minded animal friends. Price is for the set of 5 (five) safari friends as pictured. We've got plenty of inspiring holiday and Christmas decorating ideas which will make it easy to transform your house into a warm and inviting place for the holidays. We've brought together many Christmas favorites and added a new and unique selection of holiday gift ideas which we hope will bring you much delight. Transform your interior in the blink of an eye with our unique Christmas decor ideas collection. For a refreshing modern take on the holidays, shop our unique selection of hand picked Christmas gifts and decorative objects. Christmas is all about creating the right atmosphere so check out our amazing collection of wonderful Christmas ornaments, our attractive Christmas Trees, wreaths, Christmas lighting, our beautiful Christmas-tree shaped wooden advent tree, tabletop decor, jewelery and a wide variety of Christmas presents. Discover the best Christmas shop around with a wide selection of meaningful gift ideas and unique and highly decorative interior. Explore nova68 for the best in Christmas and Holiday decor. These ornaments are hand crafted by master artisans which is precisely the reason we like them. Each safari friend ornament is a "one off" piece, entirely made by hand. Please note that due to this peculiar uniqueness, customer must be able to accept understandable variations in finish as well as minor imperfections that are normal for unique hand made objects. Care instructions: clean with a soft dry cloth only. Material: sisal animals packed in wooden crate.